I'll be there on 16 April. 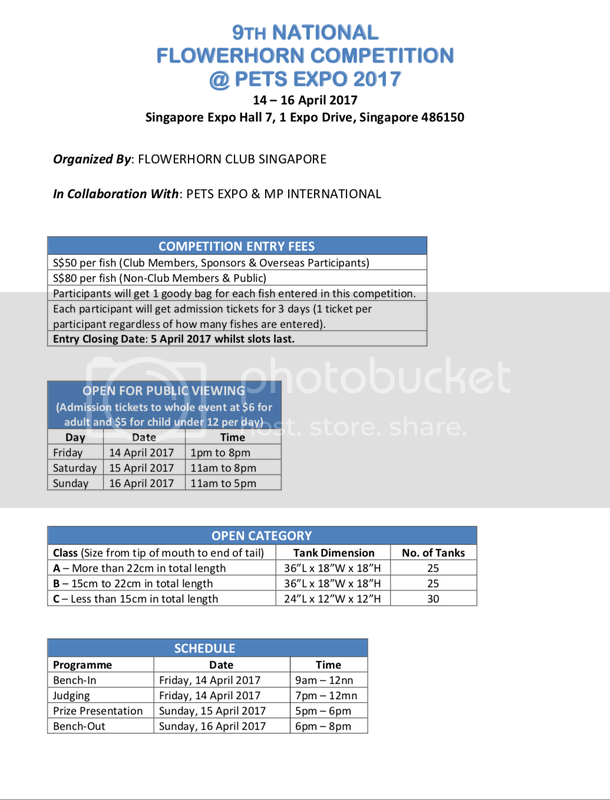 For the very first time, Pet Expo 2017 will be hosting a fish competition at its show grounds. Be mesmerised by world class Bettas, Flowerhorns and Guppies, and get to know and feel your favourite marine animals and how to take care of them at our Interactive Aqua Zone. not so sure but confirm got flowerhorn competition. Interested in exhibiting at Pet Expo 2017? Contact us at hello@petexposg.com, or +65 6389 6626 / 6393 0237 to find out more! just my tots and feedback from many farm and aqua company that I know. if everyone feel that there are nothing to see and no many go support then sure dead. I wish to go support but hor like noting about fish.... only one small place for fish.... is it for competition only? Last edited by goldfish&koi; 18-04-2017 at 04:00 PM.